Take-Two Interactive's legal effort to have the Bioshock.com domain name returned to it has ended much like Rapture itself: with a golf club upside the head. Have you ever wondered why Bioshock.com doesn't take you to a BioShock-related site? Here's your answer: The domain doesn't belong to Take-Two, or Irrational or anyone else associated with the game. It was actually purchased in December, 2004 by a Cayman Islands company called Name Administration, which is using it to link to advertisements of various sorts. It would appear on the surface to be a fairly straightforward case of cybersquatting, but a World Intellectual Property Organization arbitration panel recently decided otherwise. 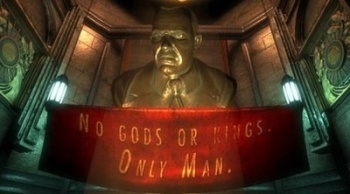 In order to force the transfer of the domain name, Take-Two had to prove that the website is "identical or confusingly similar" to a trademark held by the publisher, that Name Administration had no "legitimate interest" in the Bioshock site and that the site had been registered and was being used in bad faith. The panel found in favor of Take-Two on the first matter, agreeing that the Bioshock.com website was identical to Take-Two's trademark. But the wheels came off on the third point. Name Administration registered the domain after rumors of the game, and the name, began to circulate in late 2004, but Take-Two didn't actually trademark the BioShock name until 2005, well after the domain registration took place. Further weakening the publisher's argument was the fact that "Bioshock" is not a term exclusive to Take-Two or to videogames in general, but "is also meaningful and used in a pharmaceutical and scientific research context." Pharmaceutical giant Johnson & Johnson actually had an interest in the domain for a line of hand and skin cleanser, although it dropped the idea back in 2007. Furthermore, although perhaps a bit hard to swallow, Name Administration denied that it was aware of the "blog chatter" surrounding the game prior to the domain name registration, noting that "[Take-Two's] announcement, in the form of an interview with the game designer who stated that he was developing a successor to a game published by Irrational Gaming which he intended to call BioShock, was not associated with [Take-Two] until 2005." Bottom line is this: Take-Two didn't put a ring on it and now Bioshock.com is up in the club with gloss on its lips and a man on its hips, or something like that. However you want to put it, the panel decided to let things stand as they are, which means that unless Take-Two and Name Administration can come to some kind of deal, bioshock.com will remain out of reach. But if nothing else, maybe Take-Two has learned something from all this; Bioshock2.com is also under the control of squatters but BioshockInfinite.com is safely in the hands of Irrational.